The Most Beautiful, Versatile, and BEST KEPT SECRET in Jacksonville! 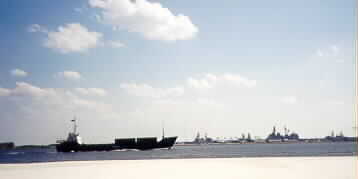 This first picture introduces you to the beautiful banks of the ST. JOHN'S RIVER as it finds its way past the Mayport Naval Base, through the channel, then out to THE JETTIES! Although the photo shows a western view of the river, you can see that it goes on and on for miles. As the sun begins to set, the campers prepare food on open grills. The air is filled with the smell of grilled meat and vegetables, while the children build castles in the sand. 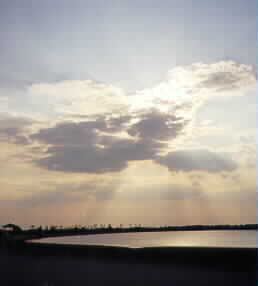 As you drive further into Huguenot Park, you'll come to the FT. GEORGE INLET area next. This part of the park is used quite frequently by WINDSURFERS. Although this little body of water may be shallow around the edges, many people catch fish here, using nets and poles. Camping is not allowed in this area, but parking is! You may park your car and remain at the park for the entire day! If you have four-wheel drive, you may also ride around to the eastern side of the inlet, through the sand, to the Atlantic Ocean side of Huguenot Park. Once you reach the ATLANTIC OCEAN, you can drive no further! You've made it to the beautiful shores of the Florida coastline. On this side of the park, you may leave the car to enjoy a little rest and relaxation, drive, lay, or walk on the beach, surf the waves, play in the water, build cities in the sand, search for shells, or even do a little fishing. Swimming, however, is allowed AT YOUR OWN RISK! There are NO LIFEGUARDS available. But there are two JSO officers who are always available if you need help and for your safety. 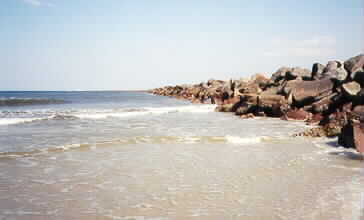 The other high point to this area of Huguenot Park is THE JETTIES! 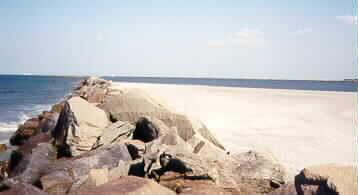 This is where the brackish water of the St. John's River and the salt water of the Atlantic Ocean come together. 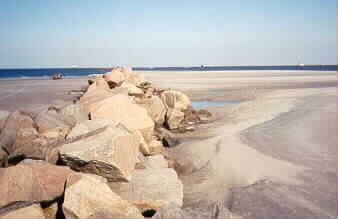 They are separated by miles of rocks which lead to the channel where the ships come in from and go out to the sea. Many fisherman declare that this is a great place to catch fish! 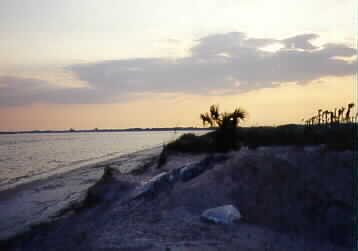 The St. John's River may be accessed from this side of the park by simply going south on the beach, and crossing the rocks to the other side. You will see the Mayport Naval Base and probably much ship activity since this is the MAIN ENTRANCE through the channel. There are many sights to see and much fun available at BEACHSIDE! The History and other precise information about the park was taken directly from a pamphlet that anyone can receive at the entrance/exit booth. The information was so summarized and precise that I chose to duplicate it on my website. This information will be followed by an asterisk at the end of each section (*). For HUGUENOT MEMORIAL PARK GENERAL and CAMPING RULES, please pick up a brochure at the entrance booth. In addition to the information that is recorded on my page, you will find detailed rules and other information pertaining to the park. THIS PAGE WILL BE UPDATED AGAIN IN 2003!!! Please return to READ MORE ABOUT and SEE OTHER PICTURES of the park that has been in the background much too long!!! 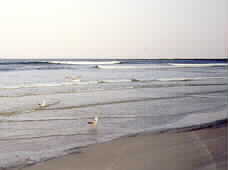 It's a GREAT PIECE OF THE COASTLINE that has been KEPT SECRET by Jacksonville Natives. You won't FEEL IT --- until you visit. Since 1999, there has been one drowning and many near drownings due to the RUN-OUTS at the park. Without LIFEGUARDS to quickly save those who may get caught in RUN-OUTS and not know what to do, a beautiful park can become a watery grave. So, PLEASE, BE CAREFUL!!! HUGUENOT PARK is beautiful, but the waters can be SO DANGEROUS. PLEASE -- WATCH YOUR CHILDREN AND WATCH OUT FOR EACH OTHER AT ALL TIMES! A KAPPA KITTEN KHARISMATIC EXPERIENCE! Just click on the above link to enter a site of VARIETY and INTERESTING "VINES"!!! From those "Vines" -- be sure to visit THE GARNER TRUCKING WEB SITE! It contains information that may save your life while sharing the road with truckers. For a personal Christmas greeting from me to you, visit My MERRY CHRISTMAS page!